HARRISBURG, Pa. – The National Frozen & Refrigerated Foods Association (NFRA) and the American Frozen Food Institute (AFFI) are pleased to announce that the Distinguished Order of Zerocrats has selected two food industry leaders as the 2018 Frozen Food Hall of Fame inductees. 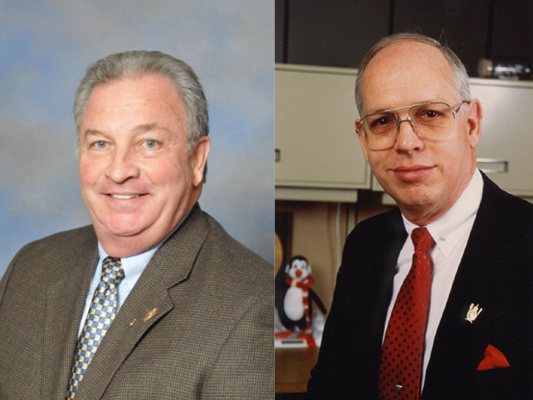 The 2018 inductees are Roger Robbe, retired vice president of wholesale food procurement, SUPERVALU, Inc. and Gary Spinazze, retired vice president of vendor relations, Nash Finch Company. Roger Robbe enjoyed a 30-year career in retail food management and wholesale food operations, merchandising, marketing, and corporate procurement. He began in the retail food industry in 1966 as a store manager for Kroger Company. In 1972, he started a 24-year career with SUPERVALU moving up the ranks as vice president, wholesale food procurement with direct responsibility for frozen and refrigerated foods. After retirement, Roger worked with the U.S. Department of Agriculture and the U.S. Foreign Agriculture Service in creating a Cold Chain Seminar in 20 Central and South American and 5 Asian countries. He also worked with organizations to create and execute USAID programs in retail operations in Africa and Ukraine. Roger was inducted into the Distinguished Order of Zerocrats in 1992 and elected chairman of NFRA in 1994 after serving many years on various Association councils and the board of directors. Gary Spinazze is a food industry veteran, with over 40 years of experience. Early in his career, he spent 17 years in retail with Chatham Super Markets. Gary moved on to Nash Finch as vice president of national accounts and later vice president of grocery procurement where his responsibilities covered perishable departments as well as store brands. Gary then worked at Bozzuto’s as director of corporate programs and trade relations. After his return to Nash Finch, he retired as vice president of vendor relations. Gary is co-founder and served as executive vice president and treasurer of Friends in Service of Heroes Foundation. He also served as chairman of the NFC Foundation, the charitable giving arm of Nash Finch. Gary served as NFRA chairman in 2009 and 2010 and has participated on many industry associations and committees throughout this career. He is currently a board member of the Distinguished Order of Zerocrats. The inductees will be honored at the Distinguished Order of Zerocrats meeting during the NFRA Convention on Saturday, October 20, 2018, at the Marriott Marquis in San Diego. The Frozen Food Hall of Fame was established in 1990 by the Distinguished Order of Zerocrats, an organization of industry members whose purpose is to maintain the tradition of promoting the image and advancement of the frozen food industry. These members nominate and vote on the newest inductees, whose dedication and hard work have greatly benefited the industry. A special industry-wide ceremony honors the imagination and innovation that have ensured the continued growth and success of the frozen food industry. Elevate Your Food Experience During March Frozen Food Month! We connect with our social communities engaging content and grow our audiences through several social media channels.